PuzzleMad: The Kamikaze Went Kaboom! Like last weeks one, this blog post may also be rather linguistically challenged! I spent all day Friday at a Coroners inquest giving evidence - a rather stressful event you'll all agree and then had an exciting day on Saturday solving this puzzle. Needless to say last night's sleep was impaired due to the adrenaline surge as well as having the cats do the wall of death around the house most of the night. It was also not helped by the present Mrs S sounding like a drowning hippopotamus all night as well! Ouch! Sorry dear, I didn't realise you were reading this! 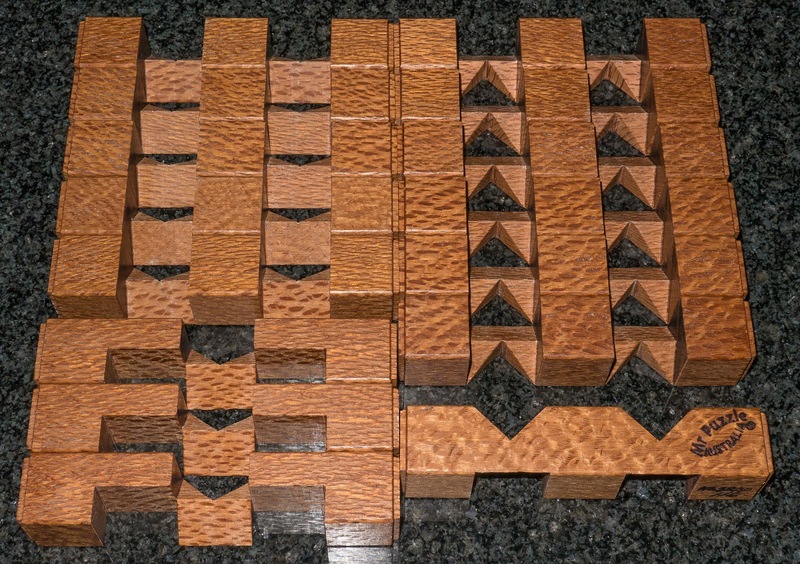 You may recall how delighted I was earlier this year when I managed to spend a large chunk of my income on the 2012 limited edition puzzles from Brian Young (aka MrPuzzle). This fabulously beautiful and fabulously huge set of 5 puzzles has had pride of place in my man puzzle cave most of this year! If you look carefully at the top shelf you will see the entire set in all it's glory! Why the top shelf? Because, if you remember from your youth, the "stuff" you wanted to look at in the newsagent when you were a teenager was always on the top shelf out of reach and tantalising! 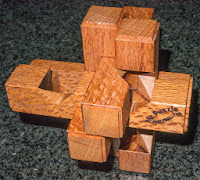 So I thought that I would mimic this and place my most "delicious" puzzles where I can't get to them! This ensures that I will pace myself and not run through them all too quickly - I want to savour them. So far I actually have managed it and have solved and written about only 2 of the 5 - the Improved H burr and the L burr, both of which were amazingly beautiful puzzles and a great challenge. 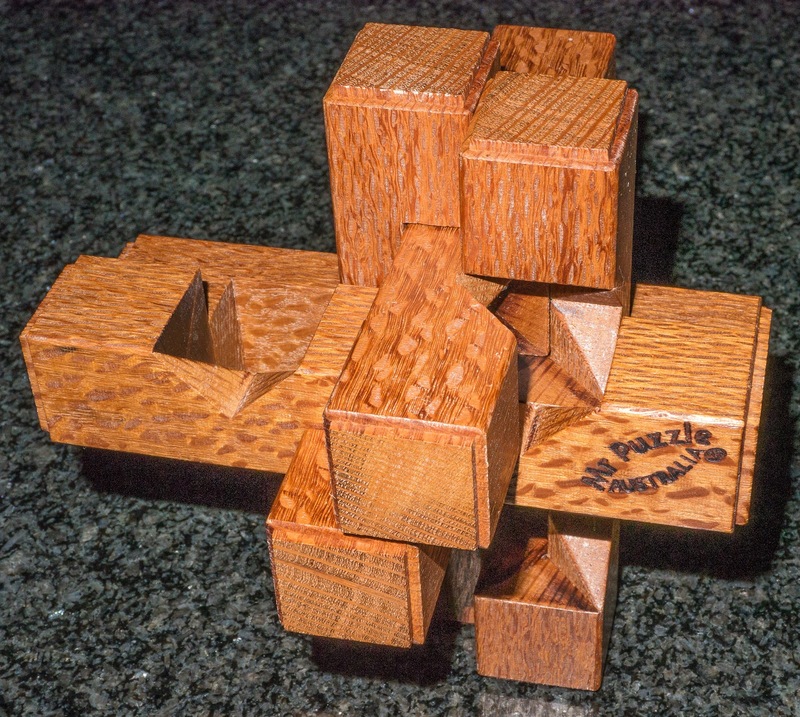 In 1995 Junichi developed a puzzle with more than one co-ordinated action. It was introduced in the bulletin of the Academy of Recreational Mathematics in Japan in that same year and has been waiting for someone to make it ever since. Brian soon discovered there was good reason for this. He found getting exactly the correct tolerances so that it moves just right very challenging. Junichi called it Kamikaze because he considers this puzzle extreme. 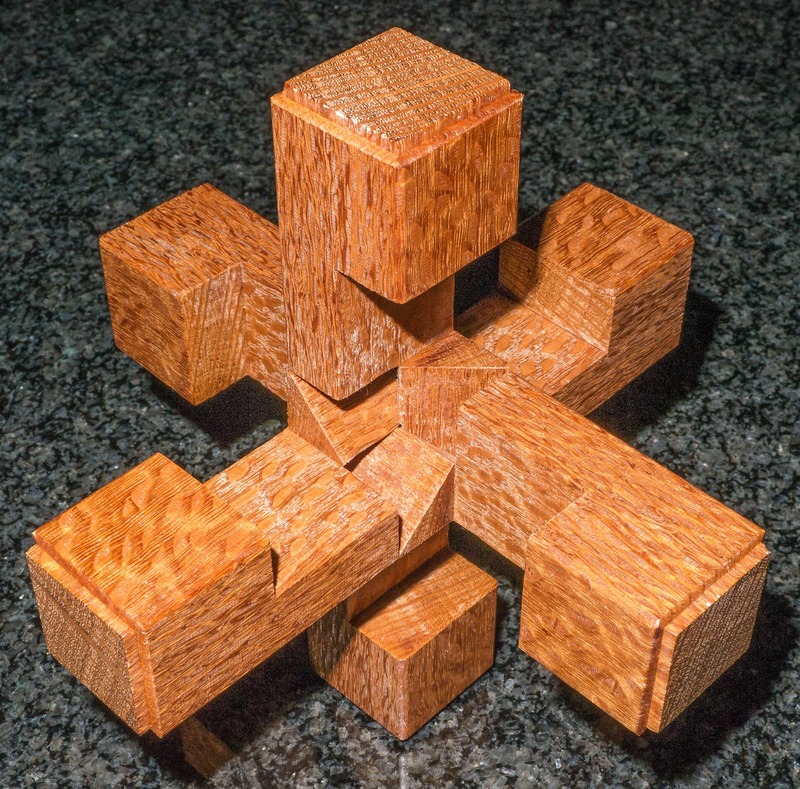 Although many puzzle solvers will know which pieces go where in the puzzle, finding the order to put them in and the motion to get it together is truly extreme. 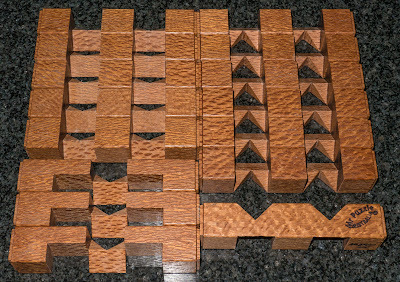 All 5 puzzles this year are quite different and radical but there is no puzzle more different or radical than this one. It is made from Queensland Silky Oak (I have always called this wood Lacewood) and is absolutely GIGANTIC at 150 x 150 x 150mm and weighing in at 830g (1lb 14oz)! So I really did not know whether I would ever get it reassembled after taking it apart. The other reason that it frightened me was the report from Burgo. 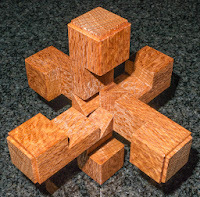 He is an amazing Australian puzzler from the Twisty Puzzles forum who is just an unbelievable solver of puzzles of all types - almost nothing fazes him or slows him down at all. At my suggestion he expanded his horizons to some wooden puzzles for his fellow countryman and his report about the Kamikaze burr was that it made a huge number of movements all at once just as he lifted it out of its packaging! So much movement that he describes a near miss underwear catastrophe! Now if a puzzler of this calibre is frightened, then what am I to think? In fact, despite my taunts, to this day he has not dared to dismantle it! I announced on Facebook that I was going to attempt it and had a short discussion with my friend Yvon about it. 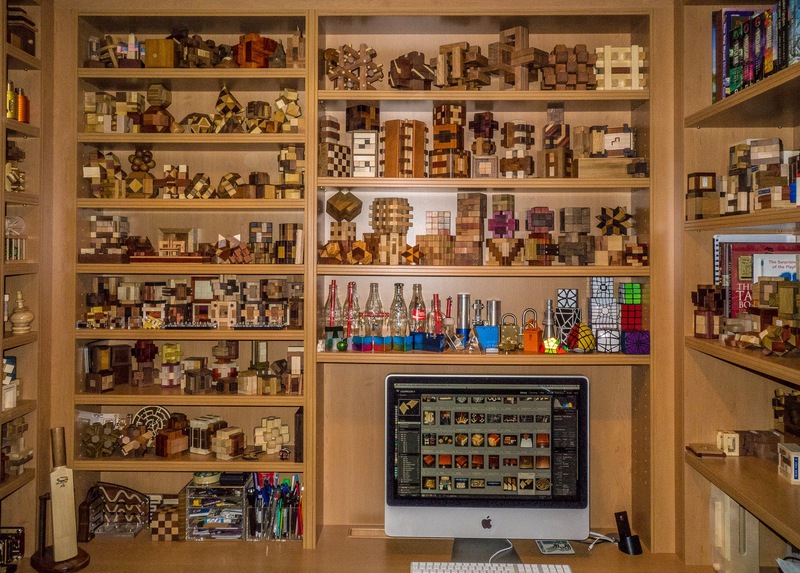 He is a voracious wooden puzzle collector and solver and apparently his version has been a pile of sticks for several months since he dismantled it! GULP!! 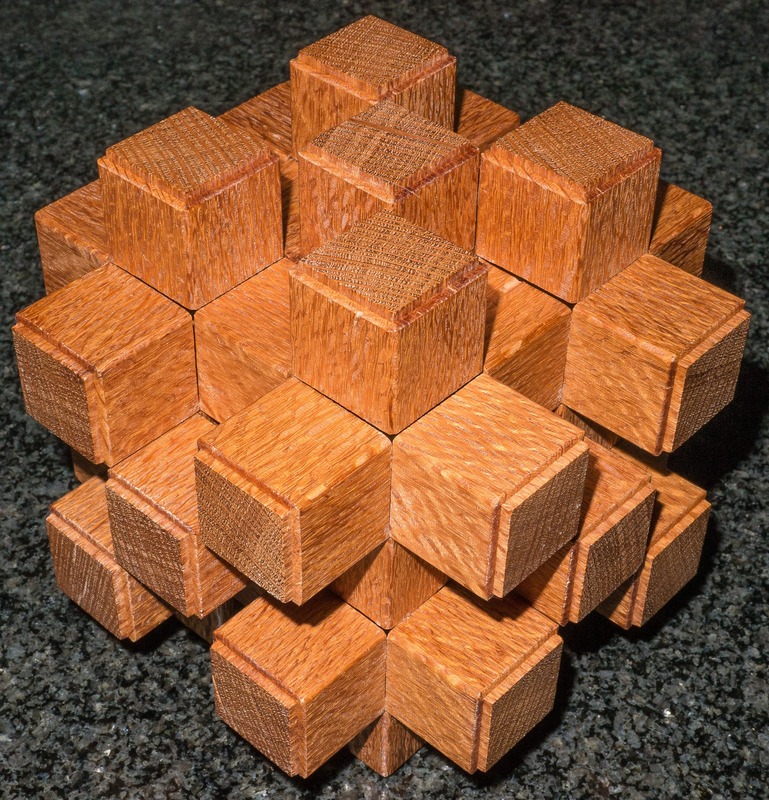 So how do I go about solving puzzles like this? Well, I don't really have any special techniques - I just push, pull, wiggle and shake (the puzzle too!) and hope that something moves. If nothing happens, then I reorient the puzzle and shake it all about all over again. This gets repeated until I either get some movement or get bored. With the Kamikaze burr I got some movement of the centre 3 sticks quite quickly as they all shifted sideways in their individual planes. Once the movement stopped I hoped that I would be able to pull one or more sticks out but no such luck! Maybe another coordinate motion would begin in another direction? There was no further movement of anything at all. I then remembered Burgo's anguish when everything seemed to move at once and decided that this initial movement that I had found must be a blind ending and incorrect. Time to reset and start again. After 15 minutes or so I had gotten nowhere and stopped for a rest. It can't be that hard, so I tried changing orientation. After several tries I decided to try the obvious one (you'll know what I mean if you have the puzzle) and very quickly things started to move..... Everywhere!!! My goodness - I understand what had frightened Burgo! EVERY SINGLE stick moved at once! How on earth does Junichi do it? I cannot understand how he visualises such a thing to make a design in his head! So the sticks all slide in various directions and then I get a real fright - KABOOM! Two of the sticks just drop out onto my desk! It was entirely unexpected and I panicked a bit that I couldn't put even those 2 back. Luckily I noted where they went and got it all together. It is my usual practice with burrs to do a bit and back-track, then repeat ad nauseam. This ensures that by the time it is fully disassembled, I have some memory of what is needed to put it back. So I went back and forth and left a nice little trail of pieces in order of removal. Each time I removed one it opened a space to remove another - very very clever. It also shows Brian's huge skills - had this been made to absolutely perfect tolerances then it would have been almost impossible to make the movements occur and get it apart. 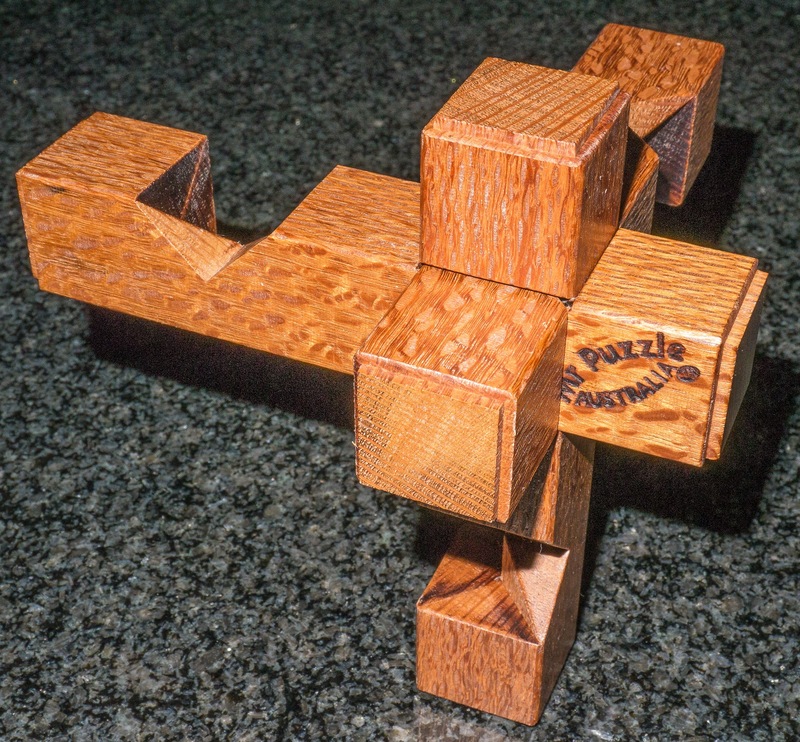 But Brian has left just the right amount of wiggle room making it stable but also a nice smooth puzzle to slide apart and solve. I was on a roll until there were just 6 pieces left and nothing further would slide out. At this point it is not hard to finish - I had to marvel that these 6 pieces came apart as a coordinate motion into 2 halves and then each half needed another coordinate motion to separate! Looking at the individual sticks reveals that 12 of them are absolutely identical and the final 3 also match. Time for a photo, a drink and then attempt reassembly. A zigzag trail of sticks! Whilst solving I had left the puzzle as a trail of sticks in my kitchen. Using the trail in reverse, I managed to reassemble it without too much trouble! Phew! Next it was time to repeat it and take a sequence of photos so I can help Yvon put his back together. After that I scrambled everything for this photo of all the pieces and managed it one last time. I have created a private photo-stream for Yvon so that he can use it to reassemble his own and if anyone else is struggling with their own copy then I will let them have access to it too. Next it will be time to make a Burrtools file just for the fun of it! I absolutely love this puzzle! It is a masterpiece of design and also an absolutely fabulous piece of craftsmanship! Brian and Junichi, I salute you both! Next, I need to summon courage for the next in the series! Wow, Kevin, very expensive puzzles you have there....very nice ones too, thanks for the write up. It did break the bank a bit but has given me many hours of fun! But it's no more expensive than your Popplock series or the Angel box! Cast Delta or Mrs S Shows Her Skillz!